A community solar project—sometimes referred to as a solar garden or shared renewable energy plant—is a solar power plant whose electricity is shared by more than one household. ‘Community solar’ can refer to both ‘community-owned’ projects as well as third party-owned plants whose electricity is shared by a community. Community solar allows people to go solar even if they do not own property on which to put their own system. Community solar is similar to but distinct from a number of other vehicles that allow individual investors, households and businesses to get involved in the quickly expanding clean energy economy. Below are some of the approaches that are sometimes confused with community solar. Group Purchasing: Group purchasing deals allow a large number of households or businesses to purchase their own individual solar systems at bulk rates through negotiations with a solar installation company. As such, group purchasing does not result in a communal project whose benefits are shared—once completed, each participant benefits separately from a separate system. In contrast, in a community solar project, all participants benefit from the same system, which is usually located on a piece of land not necessarily owned by any of the participants. Green Power: Green Power arrangements allow a utility’s customers to purchase electricity sources from renewable energy generation plants—mainly hydro and wind. Those who sign up for Green Power generally do so not in order to save money on their power bills, but instead to ‘do the right thing’; for this privilege, they pay a premium price for electricity generated by solar or wind farms. Participation in a Green Power plan does not necessarily result in the build-out of additional renewable power plants, as electricity may be sourced from preexisting facilities. Most community solar gardens, on the other hand, are developed with a primary aim of saving participants money on their power bills. Crowdfunding / Online Solar Investment Platforms: Firms like Mosaic have opened up renewable energy investment to the masses with online platforms that allow virtually anyone to invest into new solar power system installations. Under such arrangements, buy-in is set up purely as an investment, and the power that such a system generates is not associated with the participant’s electricity bill in any way—and indeed may not be located in the same utility region, state or possibly even country. Returns from these projects may be taxable, whereas the benefits from a community solar plant are not. To avoid complicated securities laws and the possibility of associated taxation, community solar project developers and administrators work from early stages to ensure that their projects are legally distinct from conventional, taxable investments. Community solar participants are therefore not viewed as ‘investors’ per se. Similarly, any energy bill savings earned by households through the community solar farm are not considered income. For these reasons there are usually rules governing community solar project participation. For example, community solar projects invite households that are geographically located within a city, town or the utility service area. Additionally, each household can only source enough power that would meet their annual needs. Because community solar is a relatively new concept, new groups, companies and even utilities are entering this industry and building community solar projects. For this reason, it is important that anyone considering a community solar program comparison-shop across all available offers, including rooftop options, in order to find the one that offers the best value for them. In a nutshell, community solar offers a way for virtually anyone to go solar, without installing solar panels on their roof or their property. Much as with Net Metering for rooftop solar power, VNM allows a household or business to receive the Net Metering credits associated with a renewable energy project with which they do not share an electricity meter. These credits are worth as much or close to as much as what they would pay for electricity from their utility. For example, every unit (kilowatt-hour or kWh) of electricity generated by the community solar farm will effectively reduce the participant’s power bill on a one-for-one basis; if the participant’s share of the plant produces 5kWh of electricity on a given day, they will receive 5kWh of solar Net Metering credits on their power bill. While VNM is currently helping to promote community solar projects across the nation, other models are already emerging to allow both consumers and developers to get involved in community solar without it. A report on the future of community solar by the Massachusetts Department of Energy Resources (DOER) suggests that other programs may supplant VNM as state Net Metering quotas are filled and alternative models become more common. Although the report is for the Massachusetts context, its observations apply to other states as well. The ability to benefit from federal and state government incentives—including Federal Investment Tax Credit (ITC). Tax credits incentivize companies to finance the development of the plant in cases where the community has insufficient tax appetite (i.e. they do not pay enough in tax to benefit from a tax credit). They also lower the cost of installing a system, ultimately making the electricity the solar PV system generates more affordable. In some cases, community solar project participants may be able to claim the tax credits for themselves. Benefit from the proceeds from selling Renewable Energy Certificates (RECs) that the system generates during its operational life. Access to SRECs will depend on the system’s location (they are not available in some states) and structure of the community solar program. Although most community solar projects aim to save participants money, there may also be cases in which environmental or social outcomes are the main goal. For example, a community may sponsor a solar array for a church or other public building. In such cases, the church or public building will not only save money on their energy bills, but also meet their environmental and/or local economic growth objectives. When projects are ownership-based, participants can either purchase their panels up-front or finance them through a loan provided by the project developer or their own bank. In this way, ownership-based community solar models are very similar to purchasing a rooftop system—except, of course, that no system will be installed on the participant’s roof or property. Instead, the participant will own a set number of panels in the array or, instead, a certain number of kilowatts (e.g. 5kW) out of the solar plant’s total capacity. In such programs, participants may only purchase enough share to meet their annual electricity usage. A matching proportion of the project’s actual output will be credited to the customer through their electricity bill or through some other arrangement with the project administrator. Ownership-based projects can be complicated to develop and administer, and the ‘ownership’ factor can be a barrier to entry for those who do not have the capital or credit rating necessary to get involved. These sorts of projects—especially when initiated by the community hoping to benefit—may also run into hurdles when it comes to tapping into the Income Tax Credit (ITC) incentive if the body formed specifically to develop the project (usually a Special Purpose Entity or SPE) does not have a substantial tax liability. In subscription-based community solar programs, participation is more fluid: A third party or a utility will develop and own the project (sometimes investing in it with the aim of taking advantage of associated tax credits) and extend an opportunity to the public to participate. The project will generally be administered by the utility, which will manage participant enrollments and billing. Program details will vary, but most require no upfront fees to join while offering savings right away. In this case, subscribing to a community solar project is akin to signing up for Green Power, except that instead of paying a premium for clean electricity, participants will pay a lower price for their electricity. As with ownership-based projects, there are limits on participation. Participants must reside within the utility’s network area, and their share of power from the project will not significantly exceed their electricity usage (with 120% of average electricity consumption being the rule-of-thumb upper limit). Interested in learning more about community solar, or seeing if there are any community solar projects available where you are? Join the EnergySage Solar Marketplace to check out your options. 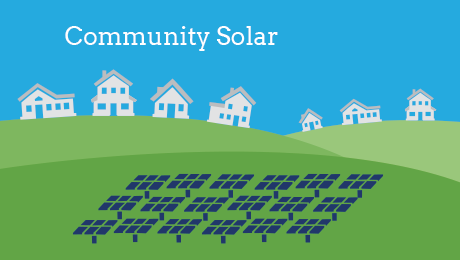 Community solar may be right for you! Support solar and see savings. Check out projects serving your area.